To Cite: Habibi P, Amanallahi A, Islami F, Naimzadeh F, Dehghan H. The Effect of Air Velocity on the Prevention of Heat Stress in Iranian Veiled Females, Jundishapur J Health Sci. 2017 ; 9(1):e36003. doi: 10.17795/jjhs.36003. Background: Some environmental factors such as the ambient temperature, radiant temperature, humidity and air velocity as well as clothing and activity level are effective to induce heat strain on the workers. Objectives: The current study aimed to evaluate the effect of air velocity on Iranian veiled females at various exercise intensities and climatic conditions. Methods: The current experimental study was conducted on 51 healthy veiled females with Islamic clothing (n = 30) in two hot-dry climatic chambers (wet-bulb globe temperature (WBGT) = 32 ± 0.1°C and WBGT = 30 ± 0.1°C, 40% relative humidity (RH) without air velocity and (n = 21) with air velocity 0.31 m/s in sitting and light workload conditions, respectively, for 60 minutes. The WBGT, oral temperature and heart rate were measured simultaneously every five minutes during the heat exposure and resting state. Data were analyzed using correlation and line regression by SPSS ver. 16. Results: In both groups, oral temperature and heart rate increased during heat exposure. The increase of oral temperature and heart rate were larger in the group with air velocity (sitting position, 37.05 ± 0.20°C, 98.30 ± 7.79 bpm, light workload, 37.34 ± 0.24°C, 124.08 ± 6.09 bpm) compared those of the group without air velocity (sitting position, 36.70 ± 0.36°C, 69.74 ± 0.98 bpm, light workload, 36.71 ± 0.27°C, 110.78 ± 17.9 bpm). The difference in physiological strain index (PSI) between resting and low workload were higher in with air velocity group than those of the group without air velocity. Conclusions: The results showed that the heat stress increased by increasing air velocity and humidity in both groups. The air velocity with high humidity can be considered as a positive factor in the occurrence of heat strain. Therefore, the incidence of heat stress decreases with the increase of humidity and reduction of air velocity or with increase of air velocity and reduction of humidity in Iranian veiled females. Air movement is one of the six main variables determining human thermal comfort; air temperature, relative humidity, ambient temperature, metabolic rate and clothing insulation are the others. Many factors have the potential to interrupt construction site work progress and impact on workers’ productivity. Heat stress is one of the factors that cause work to progress at different rates (1). Environmental factors such as ambient temperature, relative humidity, radiant heat, conduction and air velocity play major roles in contributing to heat stress problems (2). At ambient temperatures above 35°C, the skin in fact gains heat. Under such circumstances, or where the efficiency of sweating is reduced by high ambient humidity, it may not be possible to dissipate metabolic heat; heat storage leads to increase in body core temperature and the risk of illness (3-6). Heat stress in human can reduce productivity and heat exhaustion (7). Therefore, it is essential to evaluate the amount of heat-induced physiological strain that a person can tolerate during different activities (8-11). Researchers reported that some items had impact on the heat strain including: air movement (12), air conditioning (13), industrial ventilation (7), physical activity, clothing and color of clothing (14), exposure time, age, gender (15), body mass index (BMI), thirst intensity, fatigue (16), thermal discomfort and limitation in sweating (17). Moving air has long been used to provide comfort in warm environments. To evaluate heat strain a physiological strain index is described on a universal scale of 0 - 10. This index is based on only two physiological parameters, heart rate and core body temperature, which adequately depict the combined strain reflected by the cardiovascular and thermoregulatory systems (18). The current study mainly aimed to evaluate air velocity among Iranian veiled females under various exercise intensities and climatic conditions. Fifty-one veiled females participated in two related exertional heat stress investigations performing sitting and treadmill exercises in a climate chamber while wearing Islamic clothing (n = 30) without air velocity and (n = 21) with air velocity. None of the participants had a history of medical disorders for at least six months before the study. All subjects were informed about the nature of the study and potential risks of exposure to exercise in a hot climate and signed a volunteer consent form. Termination at any time was according to the physician’s decision. Trials were scheduled to last 60 minutes unless one of the following criteria was met: 1) A clear rise in core body temperature associated with a loss of thermal equilibrium (typically 0.1°C increase per five minutes for 15 minutes), 2) Core body temperature reached 39°C, 3) A sustained heart rate greater than 90% of the age-predicted maximum heart rate or 4) Participant wished to stop (19). Selection and number of samples were based on the similar empirical studies (16, 20). Heat stress trials were conducted in a climatic chamber (length 4.5 m, width 3.5 m and height 3 m) at Isfahan University of Medical Sciences, department of occupational health engineering, Isfahan, Iran. The subjects clothing were selected considering the characteristics of common Islamic clothing worn by Iranian veiled females (uniform, pants and scarf). To avoid interfering factors, the participants clothing were provided by the researchers with the same model and materials. The details related to the materials used in the Iranian female clothing include the weight of individual garments and ensembles, fabric composition and body surface area coverage are presented in Table 1. Resting values for temperature and heart rate were recorded in still conditions within five minutes of entering the climatic chamber, before adjusting the air velocity. The air velocity was increased shortly before the start of the trial, and reached the required speed within one minute after the start. During each trial, oral temperature and heart rate were recorded every five minutes for the subsequent calculations. 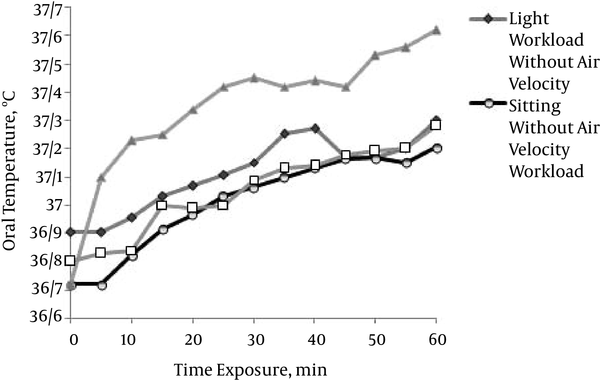 Heat exposure was performed in two separate trials, a hot-dry condition (wet-bulb globe temperature (WBGT) = 32 ± 0.1°C) for 60 minutes without physical activity (passive exposure) and a hot-dry condition (WBGT = 30 ± 0.1°C) for 60 minutes with walking on treadmill 4.8 km/hour, zero slope (10 minutes of rest per 25 minutes) (activity exposure), it should be noted that climatic chamber without the heat radiation, humidity ratio and the temperature was controlled. The threshold limit value of heat conditions based on the wet globe temperature index was 28°C for the non-acclimated individuals with a light activity which was considered 32°C in this study in order to provide more stressful conditions. Air velocity was nominal at 0.31 m s-1. This air velocity was created by three axial fans with Q = 4500 cubic feet per minute (CFM) located in the climate chamber, which created the air velocity. The climatic chamber temperature was kept constant with sensors, dry temperature and relative humidity. After 15 minutes of rest on bed outside the climatic chamber, the subjects in the climatic chamber began sitting or doing light workload. During the rests and exposures, oral temperature and heart rate were continuously measured. Heart rate was measured using a Polar heart rate monitor (Polar Electro RS100, Finland) (21) and oral temperature was measured by a medical digital thermometer (Digital Thermometer; Omron).WBGT index was also measured (22) at rest and work by heat stress monitor (Microtherm WBGT, Casella, United Kingdom). As a measure of physiological strain, coincident oral temperature and heart rate measures were used to calculate a psychological strain index (PSI) (23). In the current study, oral temperature was calculated for core body temperature (Trec) since rectal temperature measurement was not possible (14). The environmental chamber is designed as a continuous, circular corridor; therefore, the axial fans circulate a moving volume of air around a central partition, resulting in constant motion of the air in the climate chamber at the selected wind speed. Statistical analysis: The data were analyzed using correlation and line regression by SPSS ver. 16. It should be noted that there was no heat radiation in the climatic chamber. The study was approved by medical ethics committee of Isfahan University of Medical Science. All the procedures were in agreement with the Helsinki declaration. Fifty-one healthy adult veiled females completed the study. The demographic and physiological characteristics including mean and standard deviation (SD) are presented in Table 2.
aValues are expressed as mean(SD). Oral temperature reliably ranged 0.3 - 0.7°C lower than the core body temperature, averaging around 0.5°C lower than core body temperature. Core body temperature is recommended to remain below 38°C by national institute for occupational safety and health (NIOSH) and world health organization (WHO) (23). The relationship between heart rate and time exposure during sitting (32 ± 0.1°C) and light workload conditions (30 ± 0.1°C) in the groups with and without air velocity for 60 minutes is presented in Figure 1. No significant differences were observed between heart rate and time exposure in the two groups with and without air velocity in sitting and light workload conditions in veiled females with Islamic clothing for 60 minutes. 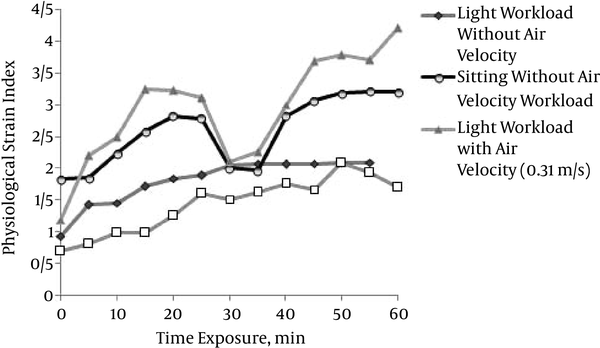 The relationship between oral temperature and time exposure during sitting (32 ± 0.1°C) and light workload conditions (30 ± 0.1°C) in the groups with and without air velocity for 60 minutes s presented in Figure 2; no significant differences were observed between oral temperature and time exposure in the two groups with and without air velocity in sitting and light workload conditions in veiled females with Islamic clothing for 60 minutes. The relationship between PSI and time exposure during sitting (32 ± 0.1°C) and light workload conditions (30 ± 0.1°C) in the groups with and without air velocity for 60 minutes is presented in Figure 3; no significant differences were observed between PSI index and time exposure in the two groups with and without air velocity in sitting and light workload conditions in veiled females with Islamic clothing for 60 minutes. Air velocity is an important factor in thermal comfort. Accordingly, the current study aimed to evaluate the effects of air velocities on body temperature and heart rate in subjects who cycled for 60 minutes in the climatic chamber during sitting (32 ± 0.1°C) and light workload (30 ± 0.1°C) in hot-dry conditions. No significant differences were observed in physiological parameters and time exposure between any of the experimental conditions. Heart rate responses of the group with air velocity to sitting and low workload conditions in the hot-dry climatic chamber were similar to those of the group without air velocity in sitting and low temperature conditions from the beginning of heat exposure, and it tended to increase gradually during the last 60 minutes in both groups, but heart rate was higher in the subjects of the group with air velocity than those of the group without air velocity. In summary, in hot-dry conditions of low air velocity, the ability of the body to lose heat is limited to the evaporative capacity of the environment. As a result, the heart rate and the oral temperature rise. At higher air velocities, the evaporative capacity of the environment increases; therefore, excess heat is dissipated and the extent of heat storage is reduced. Among objective responses, heart rate and oral temperature well reflected physiological responses in the present study, while air velocity and air condition were not sensitive enough to distinguish the differences between the two groups in veiled females with Islamic clothing. Recent studies of occupied buildings give very consistent evidence that large percentages of occupants would prefer more air movement than what they currently have, and very small percentages prefer less air movement. This is true in all conditions that occupants perceived as warm, thermally neutral, and even slightly cool (24). It describes the speed of air movement across the employee and may help cool them if the air is cooler than the environment. While air movement can be pleasant and provide comfort in some circumstances, it is sometimes unwanted and causes discomfort. This unwanted air movement is called draft and is most prevalent when the thermal sensation of the whole body is cool. People most likely feel a draft on uncovered body parts such as their head, neck, shoulders, ankles, feet and legs, but the sensation also depends on the air speed, air temperature, activity and clothing (25). Gisolfi et al. examined athletes running for 1.5 - 2.5 hours at 75% VO2max in hot conditions (33.5°C; 38% relative humidity (RH) whilst ingesting either warm water, cold water or nothing. Although subjects ran at between 12.8 and 14.4 km h-1, the air velocity was almost negligible (2.2 km h-1). Subjects who did not ingest fluid developed higher core body temperatures but only after 90 minutes of exercise (26, 27). Based on the current study findings (Figures 2 and 3), it was speculated that this difference in core body temperatures were due to the air velocity corresponding to the climatic conditions in the study. Costill et al. examined subjects who ran at 70% VO2max for two hours under moderate conditions (24.8 - 25.6°C; 49% - 55% RH). The air velocity during the trials was only 5.7 km h-1. Only after 70 minutes were the core body temperatures higher when athletes did not ingest fluid (26, 28). Heart rate, oral temperature and PSI during sitting and low workload conditions were higher in the group with air velocity than those of the group without air velocity at the same conditions. An important point is that during low workload, the resulting PSI with air velocity was higher than that of during low workload without air velocity. Previous researches comparing the thermoregulatory demands of wearing clothing during physical activity produced different results (29). During light to moderate exercise, higher core body temperature and heart rate were identified in the subjects wearing coverall-type clothing compared to shorts under hot-dry environmental conditions (30). When the environmental temperature is above physiological responses, subjects begin to absorb heat from the environment and depend entirely on evaporation for heat loss (31, 32). The results of the study showed that PSI was higher in the group with air velocity than in the group without it. At high temperatures, evaporative cooling is the principal mechanism for heat dissipation in humans. It is influenced by humidity and wind speed and by physiological factors such as respiration rate, density and activity of sweat glands. The results showed that the heart rate, oral temperature and PSI were higher in the group with air velocity than in the group without it. No significant differences in heart rate, oral temperature and PSI were observed between the groups with and without air velocity. This article was extracted from the results of the research project approved by the research council of Isfahan University of Medical Sciences, Isfahan, Iran, under registration code number 292,163. The authors highly appreciate all the students who participated in this study.